An enjoyable and noteworthy romp through the wacky Lupin universe. Lupin, the world famous thief, has met his match in the worlds most respected Secret Agent, the ageing Sir Archer. Even his gorgeous daughter Diana has managed to pull a fast one over Lupin: She's stolen his heart. But the way Lupin is, it's probably just a quick infatuation. How did Lupin get into this mess? It seems he acquired a statue, one of three in fact, that both Sir Archer and a rival group of Neo-Himmel soldiers all vying to collect them all. Sir Archer is motivated by a mysterious explosion that destroyed a section of the Eurotunnel connecting Great Britain and France, a tunnel that he is the sole insurance name holder for. After the liquidation of much of his existing assets, he is still a whopping $7 billion dollars in the hole. The only way for him to get out of this with a dime to his name is to find the legendary Harimao's treasure. Lupin just managed to get in the middle of it all and eyeing some cool spoils, he sends Fujiko to infiltrate Sir Archer's mansion. From there things go through a few rather interesting twists and turns that even fans accustomed to traditional Lupin stories will be surprised at. This being an uncut feature, there is some objectionable material that parents of Dragon Ball fanatics might object to their kids watching. For one thing, there is a transvestite Nazi that's just plain out there. It's all in good fun though and the James Bond spoofs are sure to get a lot of laughs. Okay, I'll say this show's dub is functional, but by no means the best Lupin dub out there or even FUNimation's best dub (that honor goes to Fruits Basket). But I will say that I honestly have never heard a Lupin dub that I was head over heals over. While watching the dub, I found myself trying to pick and choose which voices from past dubs I would have cast instead. I will give the cast this much credit though, I do like their energy. It's a fun dub to listen to and that makes the movie more enjoyable. 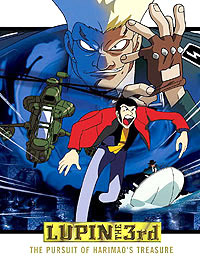 So who is the voice of Lupin? It's none other than the voice of DBZ's Krillin, Sonny Strait. No he doesn't talk through his nose this time, but you can tell it's him. He's good for the role, but not one of the voices that you'd think would make a good Lupin. Though the movie may leave viewers unfamiliar with the main characters a bit in the dark at first, it remains an enjoyable film throughout the entire experience. If you get hooked on this one, you'll definitely want to check out more of Lupin's adventures in the future.